You should definitely read this! I don’t have the right tools for this, so how do I then proceed? The light enters from a fiber port near the top left corner and is reflected of off a mirror (not installed at the time the photo was taken). The beam from the fiber is horizontal and must be turned 90° in the xy-plane, and 6,6° upwards in the xz-plane (x being left-right, y being top-bottom and z orthogonal to the baseplate). The distance from the mirror to the center of the 1st parabolic mirror, which is where the two pencil-lines in the photo cross each other is 111,5 mm in the xy-plane and 112,3 mm in space. 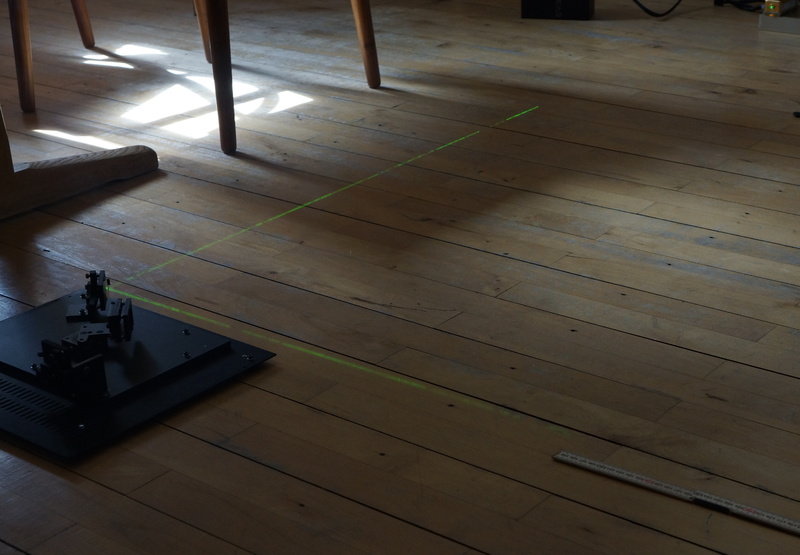 It will be impossible to align the first mirror with a ruler – which is all I have. The precision of my ruler is around 1/4 of a mm, which is around 2% on a distance of 11 cm. 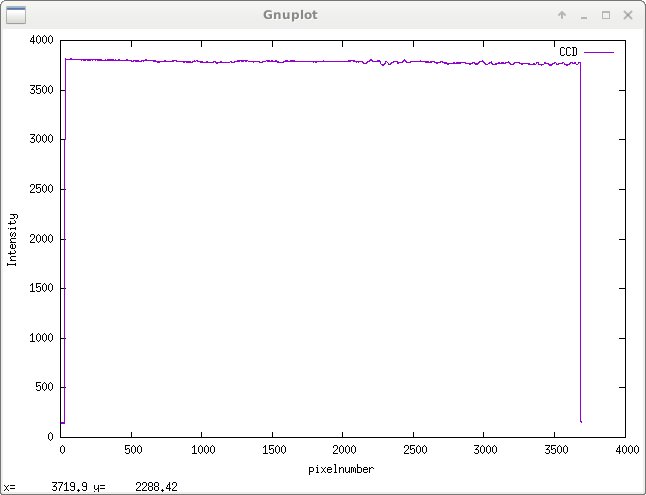 However, if I “extend” the spectrograph to 2 m, this number decreases to less than 0,1%. The laser beam comes in from the top right and is reflected by the mirror on a 3D-printed kinematic mount. At a distance of 11,5 cm from the mirror the laser beam must be 13 mm higher on the z-axis, but at 2 m from the mirror this translates to 23,2 cm. Obviously it’s much easier to achieve an elevation of 23,1 cm with acceptable tolerance compared to 1,3 cm, when all you have is a ruler.. Coherent Compass 115M-5 laser, lighting up some nicotine vapors (ok, so it’s mostly glycerin and propylene glycol). 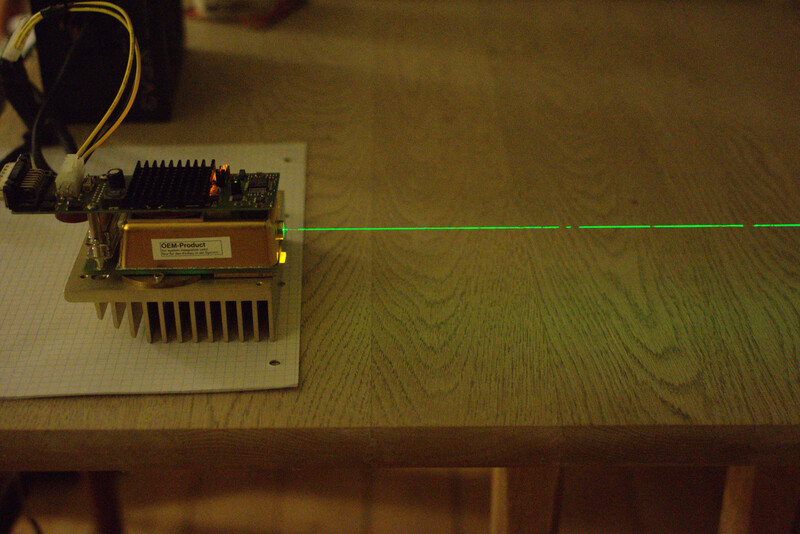 Or in fact new old toy: I managed to get my greasy paws on two Compass 115M-5 lasers some time ago. These are apparently not as nice a the other lasers in the Compass-series, but at least they were very cheap. The heatsink comes from another ebay-adventure, I think it came with the PSU for my single frequency laser (the coherent 115M is not SLM) but right now I simply cannot remember for sure. which has high speed rail-to-rail opamps on four analog inputs. The STM32F4 MCU is identified as a virtual com port (VCP) when connected to a PC. On linux it’s attached as a ttyACM-device, just as the ST-link on a nucleo board. Unlike the nucleo’s St-link (which is setup as a USART-bridge) that has a maximum bit-rate of 115.2 kbps, the STM32F405RG is working in full speed mode (12 Mbps). Of course high speed is also possible, but the HS-USB-OTG core of the STM32F405 is on different pins, and so require a different layout of the board, and 12 Mbps is fast enough that the real bottleneck becomes the read-out time of the CCD. Using essentially the same VCP framework as the UART-FW, there’s not a lot of difference in the source code (except for the large USB-stack of course). so the CLI and GUI for UART work just as well for the USB-fw. The CCD at close to full saturation. The opamp has inverted and scaled the signal to match the 12-bit ADC’s input range. The same data as in the previous figure, but the CCD’s register imbalance has been taken into account yielding a much cleaner signal. So mission accomplished. I will update the tcd1304.wordpress site someday in the near future. Download the STM32 SPL USB OTG host and device library. Download the USB CDC VCP Loopback firmware and place the zip-file in the above directory and unzip. (of course change “/home/user” and the version number). After that it should simply be a matter of entering the directory of the firmware and typing make. Let me know if it’s not working for you..
ps. I realize there’s a more straighth-forward example in the project-directory of USB library, but I just couldn’t get it working. It’s the thorlabs logo again, covering the TCD1304. The opamp (AD8027) has scaled end shifted the output to match the ADC’s range. Zero light corresponds to 145mV and full saturation is around 3.23V. Not exactly what LTspice suggested, but who cares. Pin headers for the GPIOs and u.fl. connector for the analogi input. I’m still trying to figure out the purrrfect combination of resistors for the opamp-section of the new STM32 board. No clipping this time 🙂 But of course as my good friend Kensha’s dog Feynmann would say, it’s nothing without an experiment. And so I soldered up the opamp with the resistors (and changed the two on my TCD1304-board). And of course it didn’t work.. Well it sort of did. The input doesn’t clip (and I tried with the CCD in an unaltered circuit, and the clipping is real with the old resistors). It’s just that I didn’t measure the output from the CCD’s drive circuit with adequate precision before, and so the gain and the level shift needs adjusting. The CCD’s drive circuit delivers output from just above 1.45 V to just under 3.10 V when connected to the opamp (this will sure change with R₁ and R₂). So I will try R₂ = 750R and R₁ = 390, once I get some more time on my hands. So I will try with R₃ = 620R and R₄ = 510R ..but not tonight. I deserve TV now. The firmwares for the STM32F401 are stable, and I’ve not encountered any problems or bugs in neither the SPI- nor the UART-version. Each firmware has its merits. The UART-version is usable with any computer with a USB-port, but because of the limitations of the ST-link’s implementation of a virtual com port it’s rather slow and cannot achieve frame-rates much higher than 1 Hz. 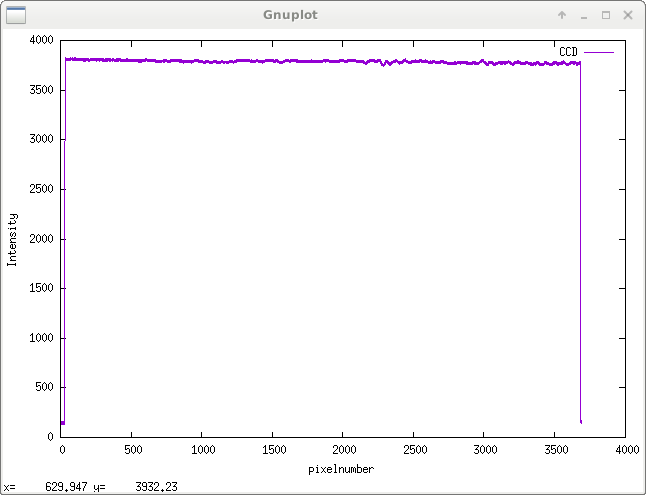 This is not a problem for Raman spectroscopy which will probably require long integration times anyway. The SPI-version is fast, but requires a raspberry pie or something else with an SPI-controller. The frame-rate can be as high as 125 Hz (or higher still, with a slight modification of the DMA-setup). This is high enough that it can be used for glowstick kinetics. But regardless of the firmware, the nucleo board is not tailored for reading the CCD. The CCD output needs conditioning to match the input range of the ADC, and a (very) cheap development board like the nucleo doesn’t include that. ok maybe it doesn’t look super-noisy, but in this graph (which is one of the cleanest) the baseline is constantly fluctuating ±4 mV. 8 mV doesn’t sound like a lot, but it’s actually a magnitude higher than the resolution of the ADC (and it’s evident from the data, that it’s not the register imbalance of the CCD in play). So after a few different PCBs (with and without opamp) the conclusion is that the noise is inherent to the nucleo board. Whether it’s the board’s layout or the choice of voltage regulators I don’t know, though Bertrand in Switzerland suggested that it could be the connection and choice of wire between the nucleo and the CCD (he’s most probably right). 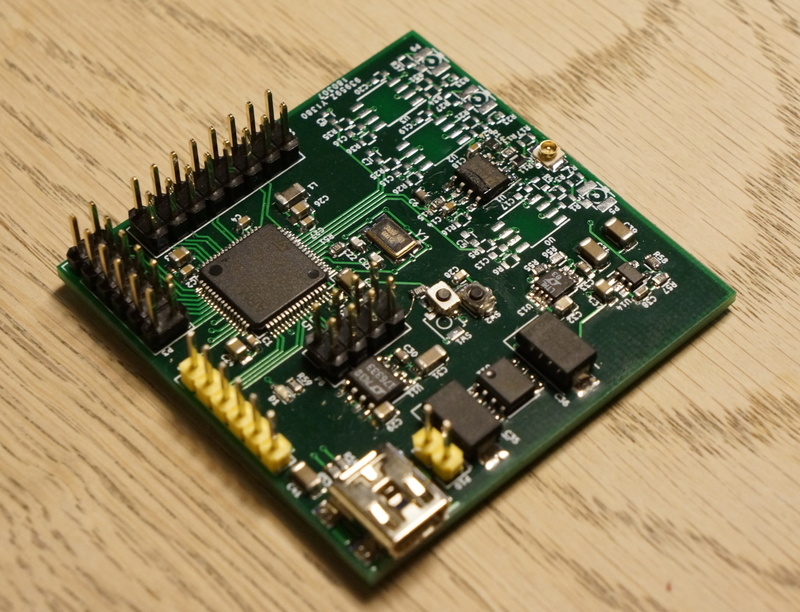 It’s an STM32F405RG on a 4-layer PCB, with discrete power planes for the digital and analog parts of the board. All regulators have a noise level of 20 µV (that’s 40x beneath the ADC’s LSB). The analog section features a ±4.65 V power supply for the four AD8027 high speed, low distortion, rail-to-rail opamps (not fitted). (sorry for the mess of the circuit). The blue trace represents the signal from the TCD1304 in the LDO-version of the PCB. The green trace is the conditioned signal, inverted and scaled to fit the range of the ADC. The plan is to use STMicro’s USB-driver to attach the board as a virtual com port. So far the DfuSe bootloader appears to be working, but I’m back to scratch for getting my compiler to produce working binaries. Being an absolute dummy with makefiles this may take a while..
Update: I hugely overestimated the troubles I would have with this last part. I can’t even remember what I changed in my f401 makefile (though I do know I did change something). The board is inspired by the STM32F4Stamp and I’ve tried to follow all recommendations in the datasheets and application notes for every component. Still I’m sure there’s room for improvement.